Do Doctors Ever Misdiagnose a Miscarriage? Naturally, most women want to be absolutely certain that they're really having a miscarriage before making decisions about treatment, but on rare occasions, doctors misdiagnose viable pregnancies as miscarriages. With something as important and devastating as a miscarriage diagnosis, it's normal to want to be 100 percent sure of the diagnosis before moving forward. With any medical problem, a misdiagnosis is a theoretical possibility. Miscarriage is no exception. Technically speaking, medical or laboratory errors could theoretically lead to a misdiagnosis of pregnancy loss at any point in pregnancy — but this is uncommon. Most doctors use established guidelines before diagnosing miscarriage. And when evaluated by these guidelines, generally laboratory and imaging results are considered reliable and accurate for diagnosing pregnancy loss. Now and then, however, miscarriage misdiagnosis does occur. When it does, the situation almost always involves a few specific situations. In early pregnancy, the embryo grows larger every day and being off even by a few days with the dating can make a difference in the measurements and in whether or not first-trimester ultrasound will detect a fetal heartbeat. Women who have irregular menstrual cycles or who were uncertain about their dates may have normal pregnancies that could initially be mistaken for missed miscarriages when the ultrasound does not show the expected development counting from the last menstrual period. Most doctors avoid the possibility of miscarriage misdiagnosis by ordering a follow-up ultrasound to check for continued development whenever there's any uncertainty about dates in an early pregnancy. When a pregnancy is viable, the gestational sac and embryo will be considerably larger after a week (the usual interval for a follow-up scan), but a nonviable pregnancy will show either no growth or minimal growth. Misdiagnosis of pregnancy loss from confusion about dates affecting ultrasound results is specific to early pregnancy. 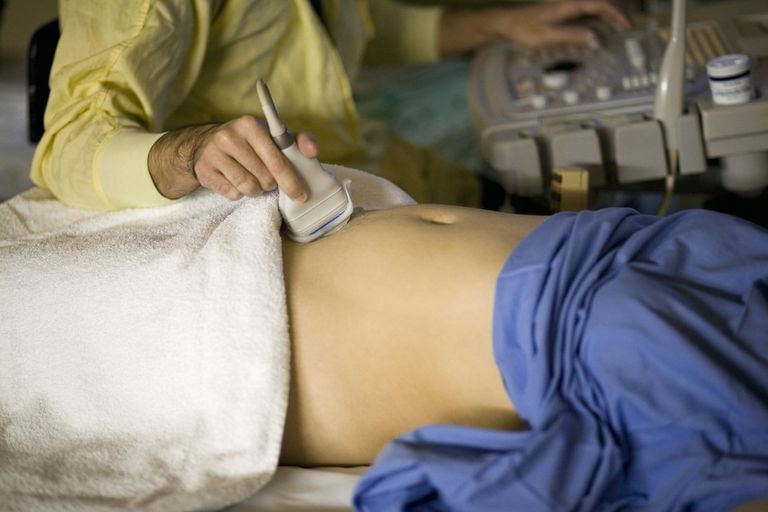 Ultrasound is increasingly reliable for diagnosing pregnancy loss as pregnancy progresses. Once the gestational sac and baby have reached a significant size, ultrasound findings can definitively diagnose miscarriage. Doctors consider slow-rising hCG levels to be a warning sign of possible ectopic pregnancy, although hCG levels occasionally rise slowly in viable pregnancies. If a diagnosis were made based solely on slow rising hCG levels, there is a possibility that it would be incorrect. Falling hCG levels nearly always mean miscarriage, but very rarely can reflect a condition like heterotopic pregnancy. Heterotopic pregnancy is a pregnancy that involves two conceptions — one viable pregnancy in the uterus and one nonviable ectopic pregnancy. In couples who conceive without assisted reproduction, heterotopic pregnancy occurs in less than 1 in 30,000 pregnancies. The rates of heterotopic pregnancy can be as high as 1 in 100 when couples use infertility treatments. Another possibility for falling hCG levels in a viable pregnancy would be vanishing twin syndrome, a twin pregnancy in which one baby is miscarried while the other is viable. This condition is also rare when couples have not used assisted reproduction and is a highly infrequent explanation of falling hCG levels. Remember also that hCG begins to decrease naturally later in pregnancy — hCG levels do not continue rising throughout pregnancy. Slow rising or falling hCG levels can be a normal finding toward the end of the first trimester. Levels of hCG start to rise more slowly by around the eighth week of pregnancy and begin to fall after reaching a peak of around 100,000 IU/L, so falling or slower rising hCG after the first two or three months of pregnancy is not necessarily a sign of miscarriage. Kelly, M.P., M.W. Molo, V.M. Maclin, Z. Binor, R.G. Rawlins, and E. Radwanska, "Human chorionic gonadotropin rise in normal and vanishing twin pregnancies." Fertility and Sterility Aug 1991. Ludwig, M., M. Kaisi, O. Bauer, and K. Diedrich, "Heterotopic pregnancy in a spontaneous cycle: do not forget about it!." European Journal of Obstetrics & Gynecology and Reproductive Biology Nov 1999. Morin, Lucie and Michiel C. Van den Hof, "Ultrasound Evaluation of First Trimester Pregnancy Complications." SOGC Clinical Practice June 2005.